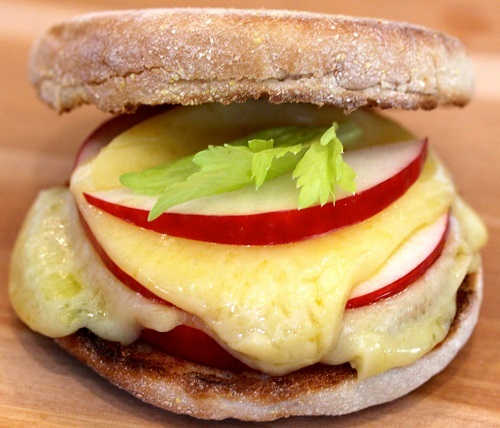 Start your kid’s day off right with these healthy breakfast recipes! 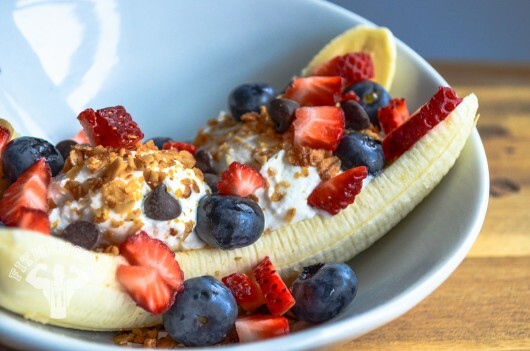 Packed with fiber, protein and slow-burning carbohydrates, these healthy kids breakfast recipes will provide the fuel to stay alert and engaged during the school day. Wake your kids up and having them running to the kitchen for breakfast with these dessert-inspired recipes. What will you choose first? Oatmeal? Let your imagination go wild when you reminisce of your favorite childhood desserts, give into your sweet tooth, and recreate your favorite dessert in a healthy and hearty way. Oatmeal: cook 1/2 cup rolled oats with 1 cup Vanilla Soy milk; about 15-20 minutes. Nuts: turn oven to broil. Place 1 tbs walnut pieces and 1 tbs silvered or sliced almonds on a baking sheet, then sprinkle with 1/4 tbs truvia, sprinkle of pumpkin pie spice & nutmeg. Broil for 3 minutes. Yogurt topping: mix 1/4 cup greek yogurt with a drop of vanilla extract and 1/4 tsp. of each: pumpkin pie spice, cinnamon, nutmeg and truvia. Then, add 1/4 tsp. truvia, drop vanilla extract, and 1/4 cup blueberries to oatmeal. 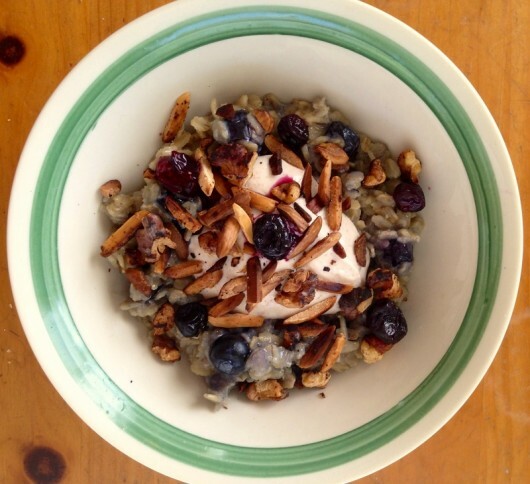 Pour oatmeal in bowl, top with yogurt, and then sprinkle with toasted nuts. You want to try something else? Every day there is a new dessert Oatmeal. Check these tasty recipes too Carrot Cake Oatmeal and Banana Cream Pie Oatmeal. Place 1 heaping scoop of Greek yogurt (add variety by scooping one flavor of each: vanilla, banana, and strawberry yogurt) into a bowl. Place sliced banana on sides. Toss on 2 sliced strawberries. Sprinkle with crushed peanuts, drizzled with organic or sugar-free syrup (caramel, honey, and/or chocolate). 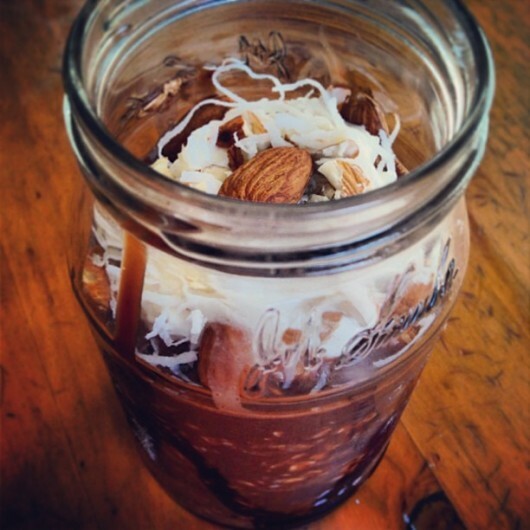 Make overnight oats: 1/2 cup rolled oats, 1/2 cup chocolate almond milk. Let sit overnight. Make coconut cream: 1 scoop 0% Greek, 1/4 tsp vanilla or coconut extract & 1 tbs coconut flakes. Drizzle organic/sugar-free chocolate syrup in bowl or jar. Pour overnight oats in jar. Sprinkle with coconut flakes and 6 raw almonds + 2 crushed almonds. A Doughnut shop favorite and fat-trap! Recreate this delicious wrap for your kids at home the healthy way. 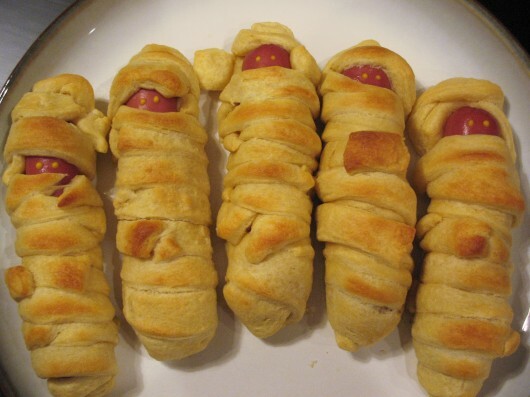 Start with low-fat crescent rolls and roll up with turkey sausage, or low-fat little smokies. Bake for 10-15 or until golden brown, serve warm. 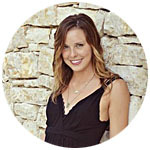 Another Doughnut shop favorite and major sugar-trap! Avoid cavities and a sugar crash by adding this healthy creation recipe to your breakfast repertoire. This is a similar recipe to the doughnut shop recipe above (Pig in a blanket), however you are going to replace the crescent rolls for croissant dough and fill the inside with fruit! Start with low-fat croissant rolls and place a dollop of homemade preserves or sugar-free jelly in the middle of the dough. Fold into a triangle, pinching the sides closed. Place on cookie sheet, and bake for 10-15 at 350 or until golden brown. Tell your kids they’re having pizza for breakfast and watch them run to their seats to devour this meal. This healthy pizza is made from whole-wheat English muffins, tomatoes, mozzarella cheese, spinach, and a drizzle of olive oil. Top your English muffin with tomatoes and spinach. Place in oven on a cookie sheet at 450 degrees for 10 minutes. Remove and enjoy this delicious breakfast immediately. Optional: Add vegetables, breakfast sausage or ham! 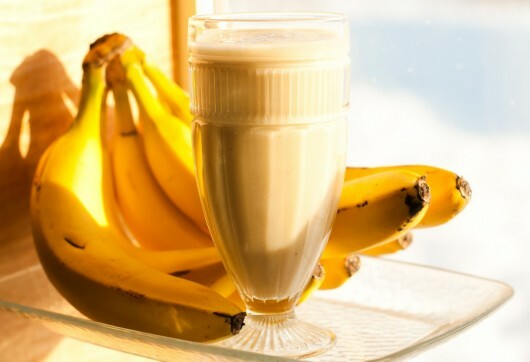 Get your little monkeys excited to start the day with this nutrient filled breakfast. Warning: Make an extra for yourself, this is amazing! 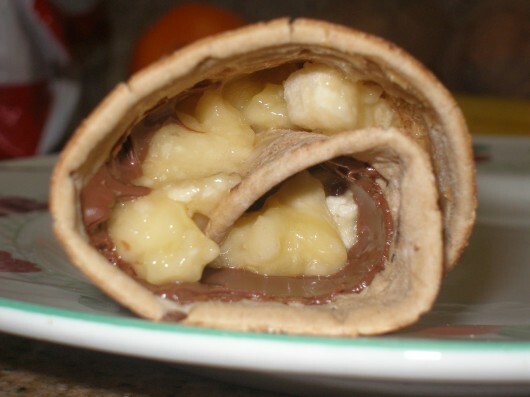 Cut banana in half. 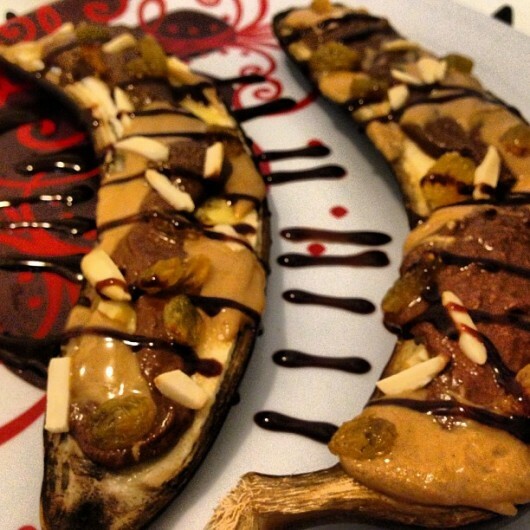 Top with favorite ingredients (Shown above with Justin’s chocolate hazelnut butter, natural peanut butter, almonds, golden raisins, and drizzled with organic chocolate syrup). Quesadilla are a fun and out-of-the-ordinary breakfast to surprise your children with. 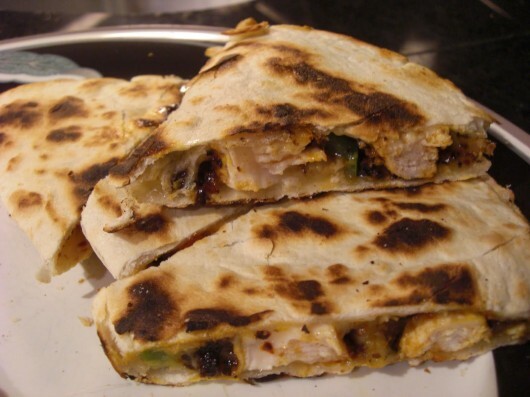 Using corn or whole-wheat tortilla, add low-fat cheese, shredded chicken, and black beans. Cook and flip each side till golden brown on stovetop. (If pressed for time in the morning, cook in microwave.). Serve with side of salsa and sliced oranges. Optional: Add scrambled eggs, cilantro, or bacon. This is a sweet switch, literally, to the recipe above (Breakfast Quesadilla). 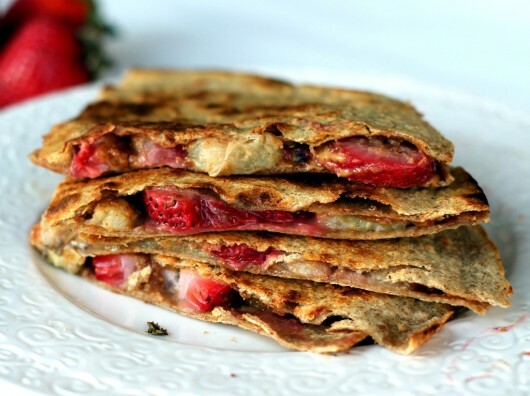 Turn the original savory quesadilla into a sweet, inciting treat: a crepe! This is crepe made easy. Using a whole-wheat tortillas, spread 2 tbs of nut butter. Optional: Swap for hazelnut butter for a different taste. 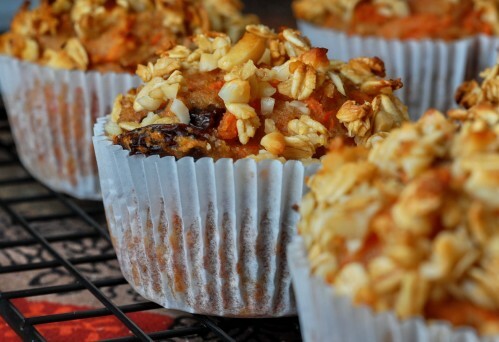 Change up your average oatmeal in a bowl to this fun-baked oatmeal cup. This is great because you can make it fresh in the morning, make ahead of time, or send your kid off to the bus with this in hand. Mix 1/4 cup oats, 1/4 cup 0% milk, 1/2 scoop vanilla whey, 1 tbs egg white, 1/4 tsp stevia, pinch baking powder, dash cinnamon & nutmeg. Pour into greased large muffin tin. Mix 1/4 cup oats, 1/4 cup chocolate almond milk, 1/2 scoop chocolate whey, 1 tbs egg white, 1 tsp cocoa powder, 1/4 tsp stevia, 1/2 strawberry mashed in (microwave to get mushy) & pinch baking powder. 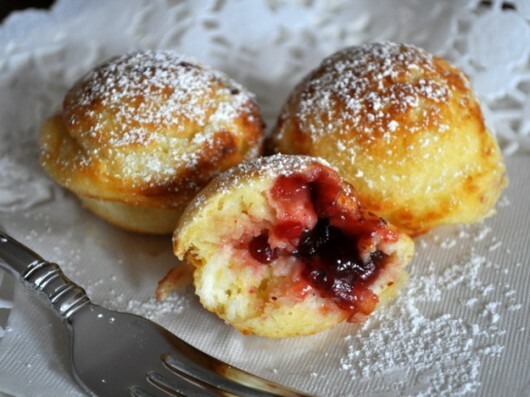 Pour into greased large muffin tin; top with 1/2 sliced strawberry. Find one of your favorite baked goods recipes and make some healthy changes: replace white flour for whole-wheat flour, whole-milk for low-fat milk, or make a healthy fat switch! ¼ cup apple sauce*, ½ cup raisins, ½ cup chop pecans, 1 cup shredded carrots. (* or one shredded apple and increase oil to ½ cup). In separate bowl, mix moist ingredients. Combine fruit and nuts with moist and dry ingredients, just enough to mix, leave lumpy. Bake in greased tin 20-35 minutes at 350, or until tooth pick comes out dry. We all know kids love to touch everything and pick up germs, so let’s sneak some Vitamin C in to their morning routine! Optional: Add 1 scoop protein powder for an extra boost, ¼ cup Greek yogurt for a creamier taste, or sneak in a handful of spinach. Replace that box mix made with artificial ingredients and chemicals! Take an extra ten minutes to make these easy, simple and healthy homemade pancakes made with pure, natural ingredients! In blender, combine 1/4 cup oats for 10-20 seconds to make oat flour. 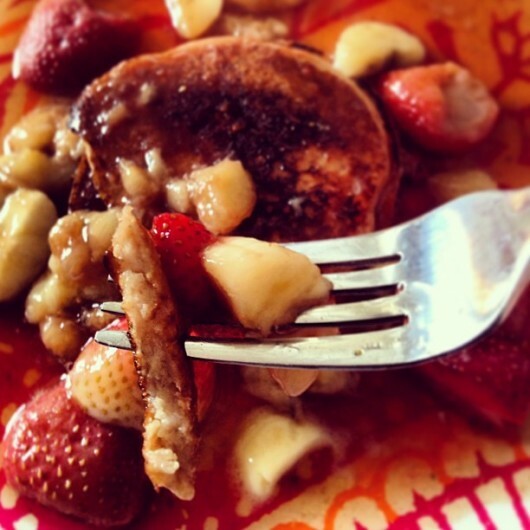 Add 1 tbs whole-wheat flour, 2 strawberries, 1/4 banana, 1 tbs egg whites, 2 tbs vanilla soy & 1/4 tsp trivia. Pour batter onto hot greased skillet (Makes 1 big or 3 small pancakes). Cook 1-2 minutes each side. Meanwhile, on stovetop heat up sugar-free or lite syrup with 3 diced strawberries and 1/4 cut banana. Place pancakes on plate and pour fruity syrup over your yummy stack of pancakes. This is always a fun, easy dish! A hearty slice of whole-wheat bread gives your youngster a healthy carbohydrate, while the egg provides healthy fat and protein. Flip after 2-3 minutes, cover with slice of cheddar cheese and sprinkle with salt & pepper. 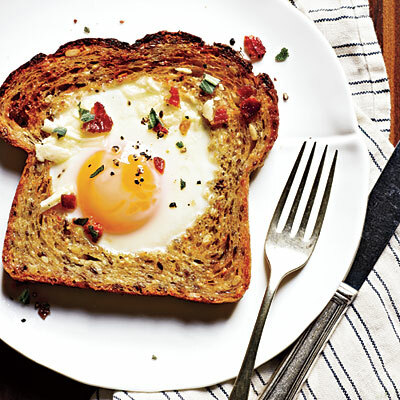 Make this hearty meal the morning of or prepare a loaf for the entire week. 1 egg + 2 egg-whites and preferred spices. Bake covered for 30-40 minutes, then bake uncovered for last 10 minutes (loaf should be a nice, golden brown). Optional: For a savory tongue, top with salsa, and for the sweet tooth, drizzle for low-fat or sugar-free syrup. 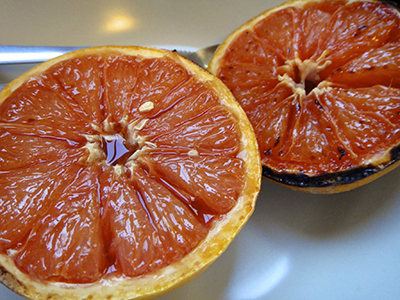 Grapefruit is a great antioxidant and power fruit to start your child’s day with. 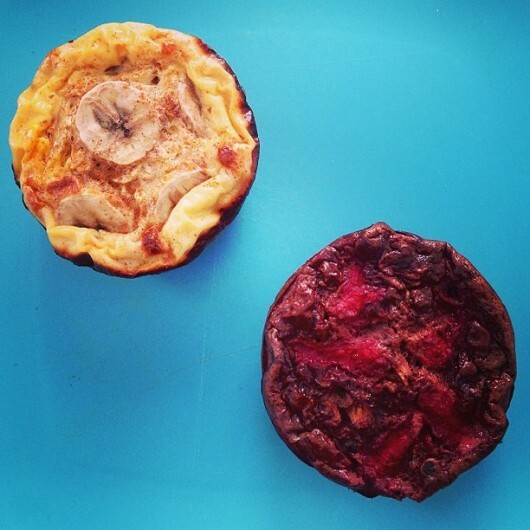 Add an appealing sweetness to this tart fruit by broiling it for breakfast. Sprinkle with brown sugar and broil till bubbling and browning (4-6 minutes). Serve with side of Greek yogurt and honey. Tired of the same old toast and jelly? 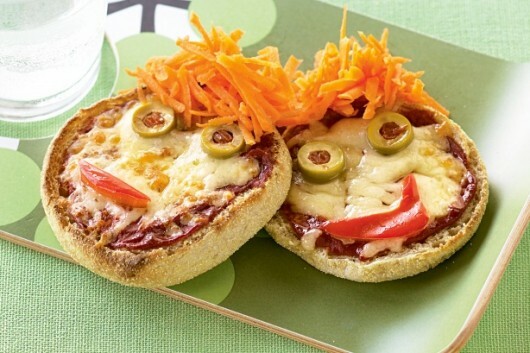 Excite your child’s taste buds with this simultaneous sweet and savory breakfast. 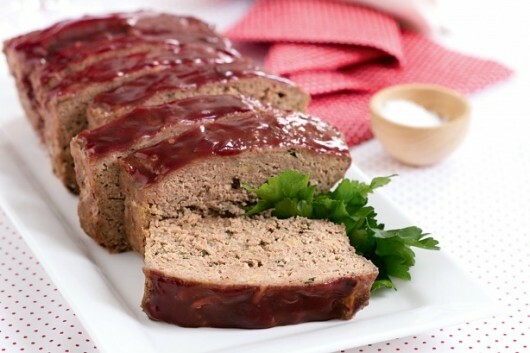 Top with cheddar cheese and place in oven at 350 for 5-10 minutes or until golden grown. Peanut butter is a great fuel in the morning because it provides protein, carbohydrates, and healthy fats for your growing child. Make this simple, tasty treat in minutes! Add ½ sliced banana, and add a few dark chocolate chips. Optional: Use almond butter, hazelnut butter, or drizzle honey. Literally an apple sandwich! Excite your child in the morning with this crunchy, sweet treat! 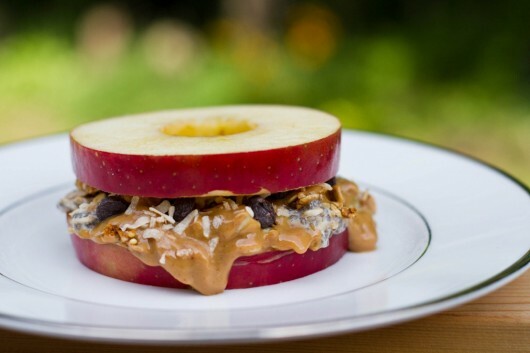 Slice apples, spread almond butter, and stack. Roll with low-fat granola and serve with side of milk. 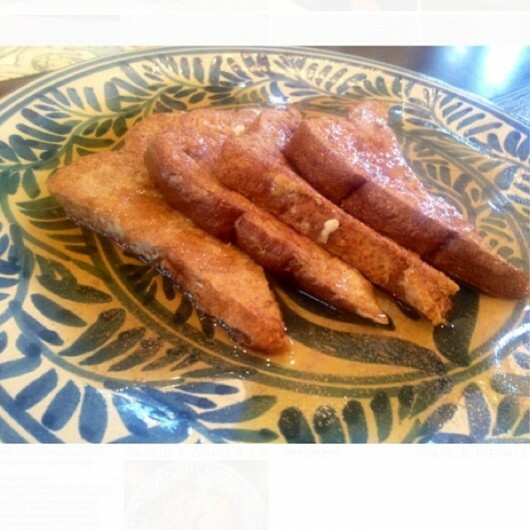 French toast is a perfect breakfast staple. 1 egg, 1 tbs soymilk, a big dash of cinnamon & nutmeg. Splash of vanilla extract and stir. Dip in two pieces of bread and toss them on a hot skillet. Flip each side for 2 minutes. Optional: Top with walnuts and fresh berries or roll in cereal for an extra crunch. 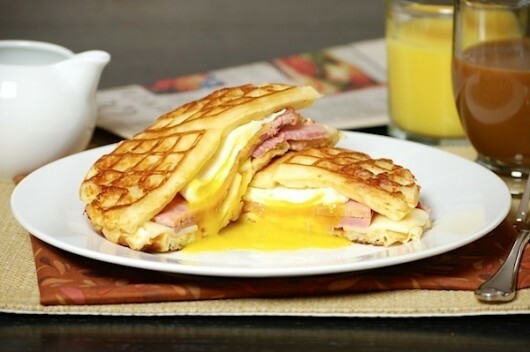 A creative twist on the classic waffle breakfast. Instead of topping your toaster classic waffle with butter and syrup, change it up! Toast 2 waffles (low-fat or whole grain) and assemble with 1 egg over easy. Add turkey sausage or turkey bacon, 1 slice of tomato and sliced avocado.